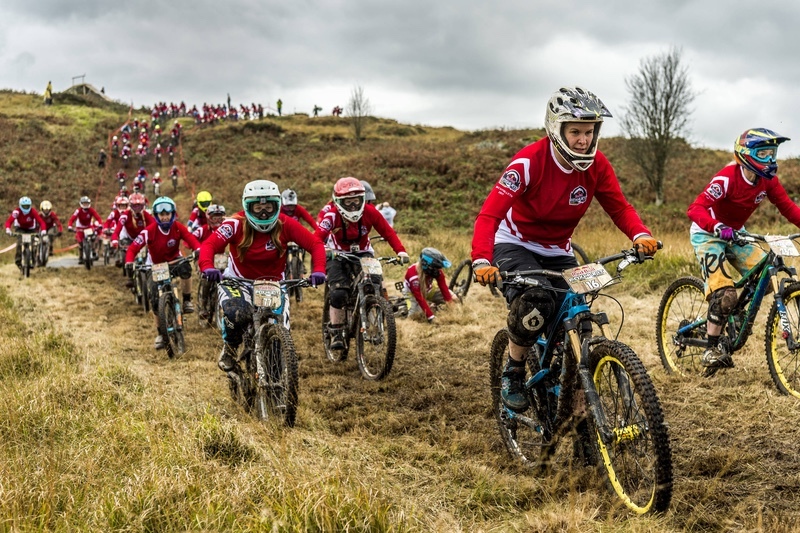 Red Bull Foxhunt is returning to the hills of Machynlleth, Wales on 29-30 September 2018 as five time MTB world champion Rachel Atherton, who missed out last year due to injury, returns as the fox. Entries for Red Bull Foxhunt will go live on 18th June. Red Bull Foxhunt turns the traditional notion of a Foxhunt upside down, and has the Fox – five time World Champion & Red Bull athlete Rachel Atherton – chasing down the hounds – 300 female downhill mountain bikers, in the world’s only all-female downhill race. Traditional roles (of the now banned act of fox hunting in the UK) will be reversed, as the hunters become the hunted. A mass start will see 300 female riders playing the part of the hounds as they try to outride one of the best female downhill racers in the world – Rachel Atherton. The Welsh route proved popular last year; and, according to the organising team, is the most challenging yet. The 300 riders will need to battle it out down the specially built course without being caught. Combining tight wooded sections and open spaces, riders will have to be alert to dodge the trees, keep their elbows out to hold their place, and sprint down the course to stop other riders and the five time World Champion pass. The hounds will also need to think about tactics as a mass participation start calls for some clever thinking about which line to take and where to sit in the pack to avoid crashing. Entries for the 2017 event sold out in a record time of 12 minutes. Last year’s event took place in Rachel Atherton’s home town of Machynlleth and a new technically challenging course tested the riders to the max as they tried to stay ahead of the fox. The honorary fox in 2017 was Atherton’s Trek Factory Racing Enduro teammate Katy Winton, who managed to catch a number of the women. Entries for the 2018 edition will go live on 18th June, for 300 experienced riders to compete in Machynlleth. The event includes practice runs, seeding and, of course, the main event against a festival backdrop of entertainment and refreshments for the female downhill MTB community to enjoy. wooo! there’s me, muddy 77! what a muddy race, shame they hiked the price up yet again this year. The conditions last year were awful, I had to carry my bike across the line along with other ladies as it clogged up with mud. Bit of a shame as it is such a great event.